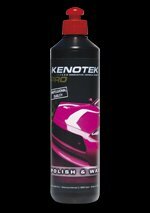 The Kenotek product for the largest area of any car, van, motorhome, caravan or other vehicle - bodywork. So it has to be easy to be a successful product - and it certainly is that. Kenotek polish and wax removes contaminants and small scratches from paintwork. It then buffs to provide unequalled gloss and high-end protection. Can be applied manually or with a polishing machine - it works with a simple wipe on, buff off method.